Now you can be like a professional knife grinder at home with this kit of angled drill attachment sharpening stones, 360 degree swivel vice and drill clamp. So you have two stones, fine for all your knives and scissors, coarse for your shears, large knives and lawn mower blades. You put your power drill in the included drill clamp, and it makes a specialised bench grinder. 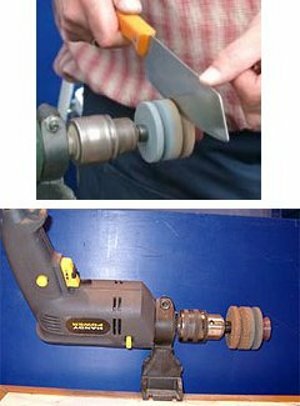 Run your drill stones rotating away from you and you are ready to grind and sharpen. Angled grooves on the blade sharpener stones cut at the correct angle for you. Even when sharpening your lawn mover blades. Also included are a hex key to swap out the stones (we are not talking a grinding wheel which can quickly wear out here) and a 360 degree swivel vice. As well as keeping your own knives and cutting tools sharp, sharpening blades is a lovely thing to do for family and friends. Blade Sharpener text, images and video are copyright.